Calling all brilliant minds. We want to hear from you. Be a speaker at the 2018 edition of the leading event for smart communities on 29th March in Bucharest. Share your knowledge and your vision. This is the place to let your ideas spread. Regardless of your industry, role or focus area, we want to learn from your experiences. 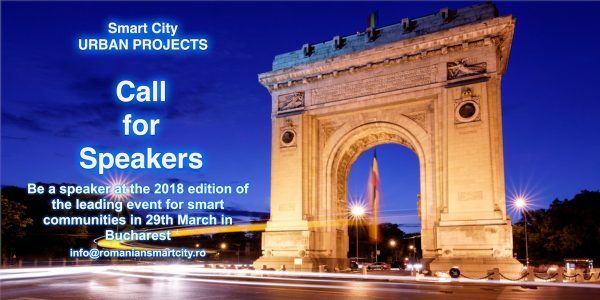 The Romanian Smart City and Mobility Association invites International members, industry associates, business professionals and educators to submit a proposal to be considered for a maximum one-hour presentation within our Professional Development Program. Here, your ideas and suggestions can be the real source of inspiration for the good change of entire communities! Knew the Smart City Urban Projects audience. Our audience comprises qualified consumer technology industry attendees looking for real B2B applications. Reviewed the form carefully before submitting. Did not pitch products, companies or services. Submissions contain clear takeaways for the audience. Linked to the speaker bio on the contact information page. Make sure the speaker bio is clear on why this person is an authority on subject matter. Provided case studies or research that will assist the audience in their own business applications. Thank you for your interest in the Smart City URBAN Projects event program! Applicants will receive a speaking status update by 10 March, via email to the address provided on the submission form.